Hive Jump is one of the most exciting Kickstarter campaigns in a very long time, perfectly blending the frantic run ‘n gun action of classic shooters like Contra with the unpredictability of Spelunky‘s random generated levels. If that’s not enough then developer Graphite Lab has an entirely new level for the game to operate on as well. As promised when the game reached 50 percent funding, Graphite Lab has spelled out the game’s tactic elements. 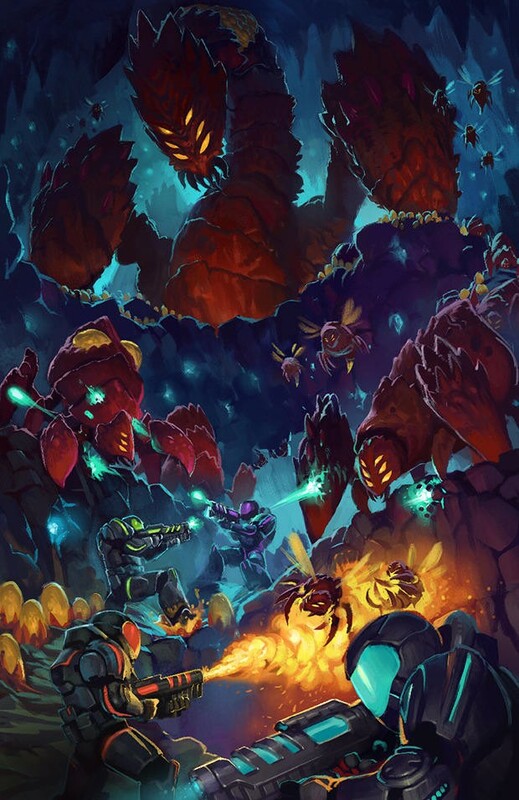 When your troops, known as Jumpers in the game, battle it out with the bugs deep underneath the surface, they aren’t just fighting for their own survival. They are part of planet-wide campaign bent on destroying these parasites once and for all. Your job is to not only control these soldiers in the thick of battle but also to wage the war from above, assigning troops to different hives, managing resources, defending your territory, and flat out carpet bombing the enemy if they become too powerful. Granted, it’s not quite as deep as XCOM Enemy Unknown, but the inspiration is clearly there. You’ll have troops which improve with experience, and you’ll definitely want the better ones to survive. The soldiers you rescue from the depths will act as great back-up support, and of course, the resources you mine up will allow you to build new weapons to take on missions, set up stronger fortifications for your base, and research various other upgrades to give your an edge in battle. You and the alien bugs will take turns on the map in placing troops and waging the war. They have the ability to overtake your bases if left unfortified, and you might easily find yourself pressed against the ropes if you’re not careful. Your twitch shooting skills will mean nothing if you can’t think two steps ahead of the enemy. I would have been fine with Hive Jump just being a simple procedurally generated run ‘ gun action game with gorgeously animated sprites and a great sense of style, but this new strategy takes me to a whole new level of excitement. I really hope this game succeeds, because I don’t want to wait the extra time it will take if it fails. Hive Jump currently sits at $28,000 out of its requested $50,000, and it has 10 days remaining. Graphite Labs is currently aiming for a release on PC, Mac, Linux, and Wii U at the most basic level. A $175,000 stretch goal will bring it to the Xbox One and likewise for $235,000 goal and the PlayStation 4. They seem a bit out of reach at the moment but anything is possible.